From the PTUA’s September newsletter. Join now to receive regular newsletters and support better public transport. So why do we now see an assortment of arguments in the public media by the road lobby, government officials and consultants that Doncaster rail service is unviable? The Baillieu Government now touts as its number one infrastructure priority the westward extension of the Eastern Freeway through Carlton and Fitzroy — a project never mentioned during the 2010 election campaign. In doing so it conveniently mirrors the wish-list of the RACV. It also inherits the road lobby’s political interest in sidelining Doncaster and other promised rail extensions, in order to assemble a fiscal ‘war chest’ for this very costly road. Against this, the community groups and local councils campaigning for the Doncaster line with the PTUA have been redoubling their efforts to counter the threat. Transport experts have now weighed in, with a report by RMIT and Curtin University researchers garnering recent media headlines (“Doncaster railway line could be built for $840m“, The Age, 24 July 2012). Commissioned by a group of six north-east suburban councils, the report concluded the line could be built at modest cost and would attract significant patronage. The expert’s cost estimates, encouragingly, are not far off the PTUA’s own figures based on actual costs for Perth’s rail lines and Melbourne’s EastLink tunnels. 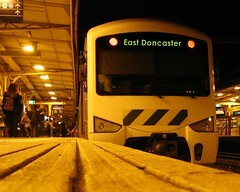 Yet the report prompted immediate public criticism from the leader of the Doncaster Rail Study team. The response is curious, as it is not usual for the leaders of ‘independent’ studies for government, that have not yet publicly reported their own findings, to publicly preempt their inquiries in this way—after giving themselves barely a day to consider outside views. But it has become common to assert, in particular, that there is insufficient capacity on the rail tracks from Clifton Hill to the city to accommodate trains from Doncaster, South Morang and Hurstbridge all together. Informed analysis shows otherwise: the system now in place should suffice to handle six trains per hour on the Doncaster line in addition to the forecast peak services on the South Morang and Hurstbridge lines through to 2020. The ‘capacity’ argument has become a self-perpetuating put-down that, through sheer repetition, aims to dampen the community’s expectations of its public transport system. The steady critique against Doncaster rail appears designed to provide cover for the Baillieu Government having dug itself into a hole on the issue. The government has seemingly been corralled behind closed doors into placing all its transport infrastructure eggs in one rotten basket — the east-west motorway — despite coming to power riding a wave of community frustration over the failings of the public transport system, and promising a new deal for public transport. The government’s current rhetoric and actions smack of weakness and dishonesty. Together with local councils and community groups, we will keep working to hold the government to its promises. For World Carfree Day, there is a rally against the proposed east-west motorway, 10:45am on Saturday September 22nd at the corner of Nicholson Street and Alexandra Parade, Carlton. Details here.